Elegant! Outstanding! Beautiful! These were just some of the adjectives used to describe the 40th Anniversary Gala celebration held the evening of November 24th at Cirque Éloïze in Old Montreal. The honorees were Fagey and Simon Rossdeutscher and Judith and Harry Rossdeutscher. 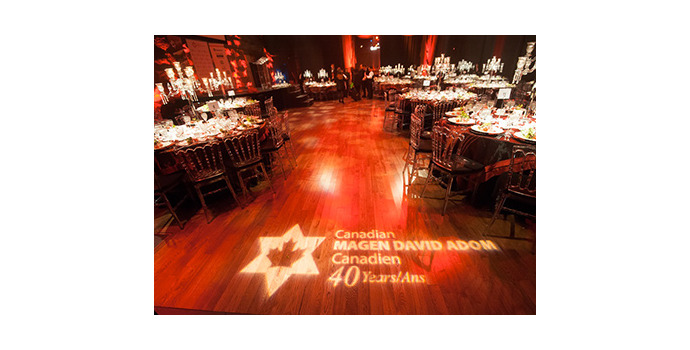 Philanthropy plays an important part in the lives of the Rossdeutscher family, as demonstrated by their involvement with Canadian Magen David Adom, a relationship which has spanned more than 30 years and includes the donation of six ambulances to the people of Israel. The most recent ambulance was dedicated in October in memory of the Rossdeutschers’ beloved rabbi and friend, Sidney Shoham, Rabbi Emeritus of Cote St. Luc’s Beth Zion Congregation. Master of Ceremony Tommy Schnurmacher, Montreal CJAD radio talk-show host, greeted the 300 guests and acknowledged the dedication and support of the Rossdeutschers, together with CMDA National President, Michael I. Levine, who welcomed everyone to this important milestone. In addition to outstanding acrobatic acts by members of the Cirque Éloïze troupe, highlights included the blowing of the Shofar by Howard Rossdeutscher, son of Judith and Harry Rossdeutscher, the keynote address by Rabbi Yaakov Litzman, Israel’s Minister of Health, who made a special trip to Montreal for this occasion, video greetings from Reuven Rivlin, President of Israel and from Denis Coderre, Mayor of Montreal. Special dignitaries included Consul General of Israel, Ziv Nevo Kulman; MNA, d’Arcy McGee, David Birnbaum; and Montreal City Councillor, Lionel Perez. Representing Magen David Adom Israel were MDA Director General Eli Bin, Deputy Director of Fundraising and International Relations and Canada Desk representative, Ilan Klein, and Paramedics Assi Dvilansky and Ouri Shacham. Special thanks are extended to our sponsors – Medicom, The Morris & Rosalind Goodman Family Foundation, BSR Group, Demers Ambulances, TD Levine Barrette, TD Gail Malone, Zukor Investment Group, and Scotiabank. The generosity and presence of all who attended helped to make this wonderful sold-out celebration an evening to remember.